Hand made functional ceramic objects, each piece entirely unique. 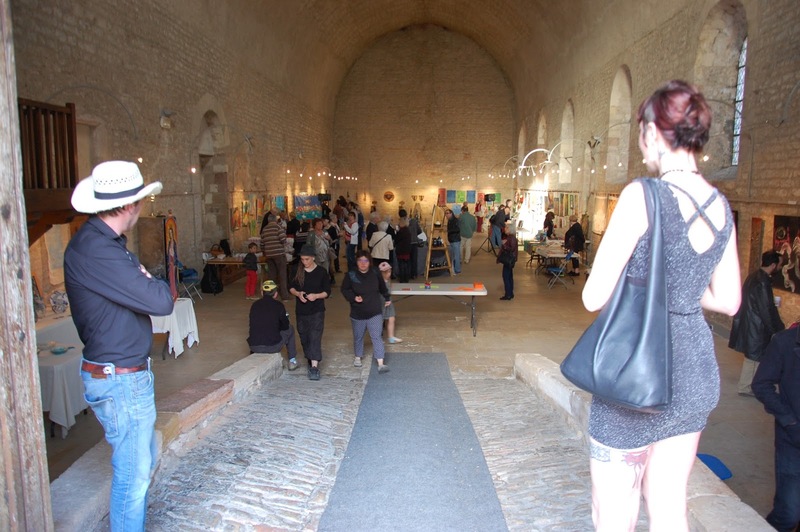 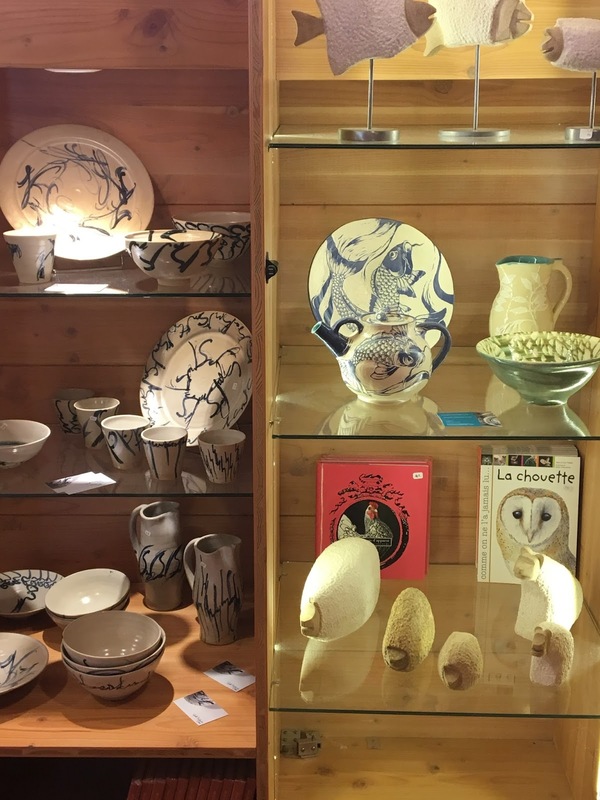 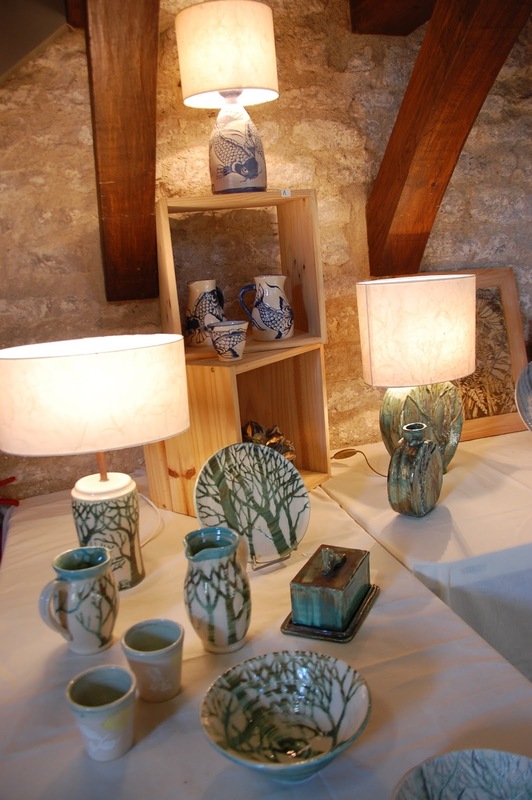 My workshop is located in the village of Ratenelle, Saone et Loire, France. Please contact me directly for information or commissions. Le Bourg, Ratenelle, 71290, France. 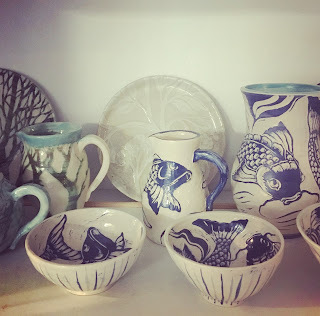 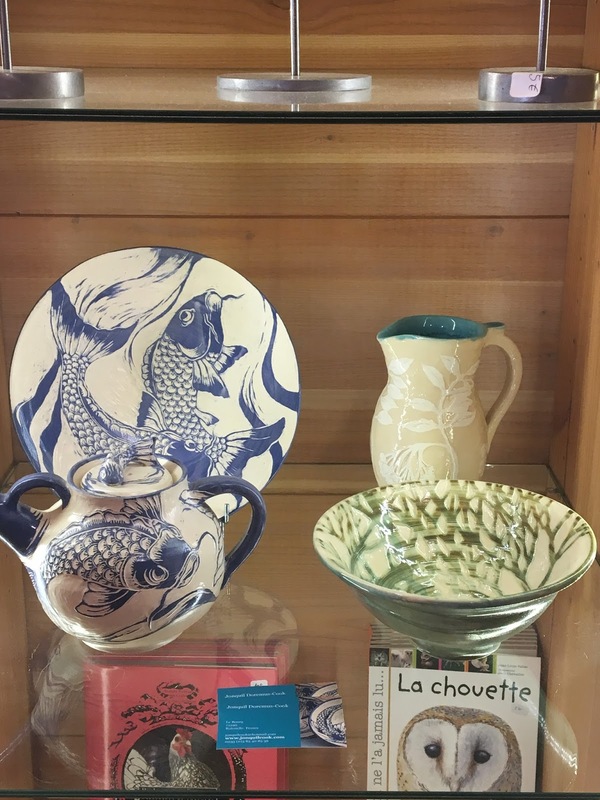 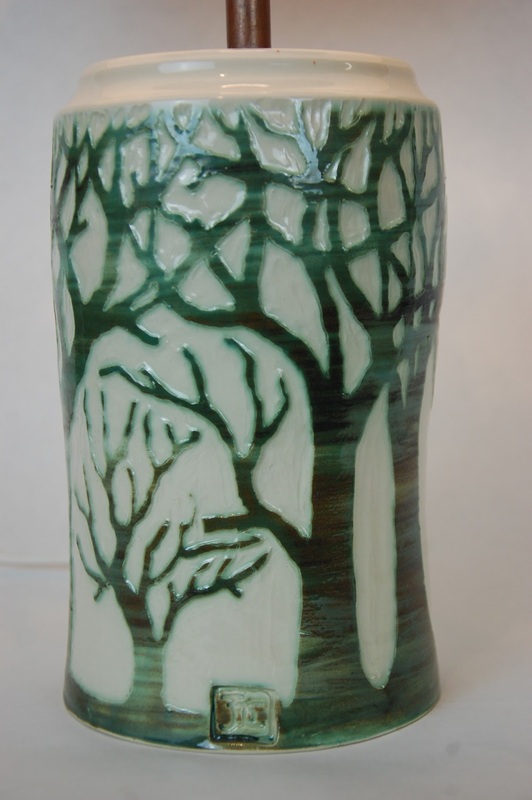 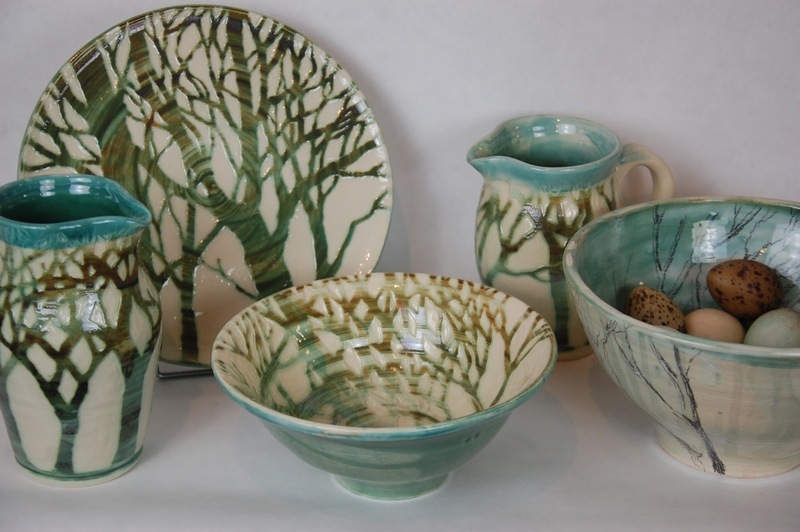 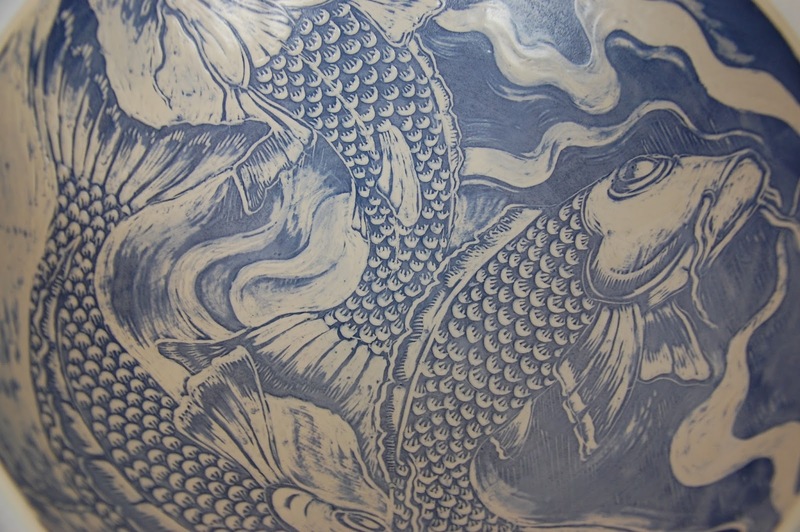 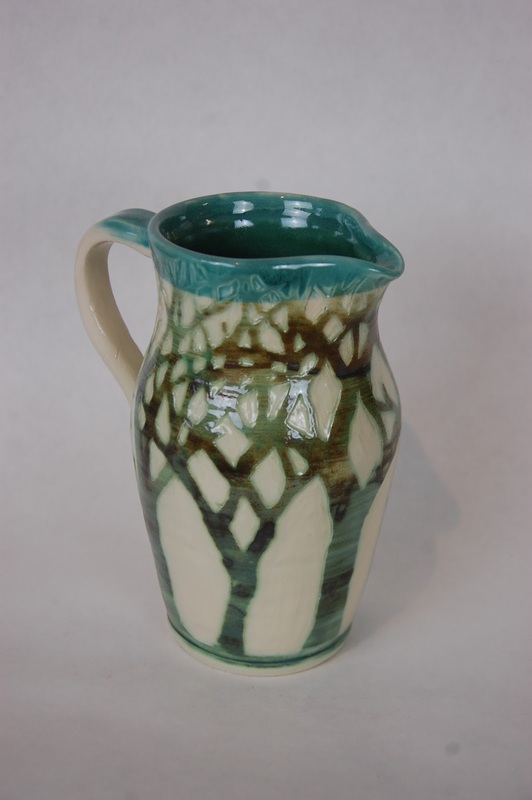 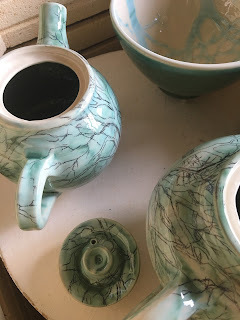 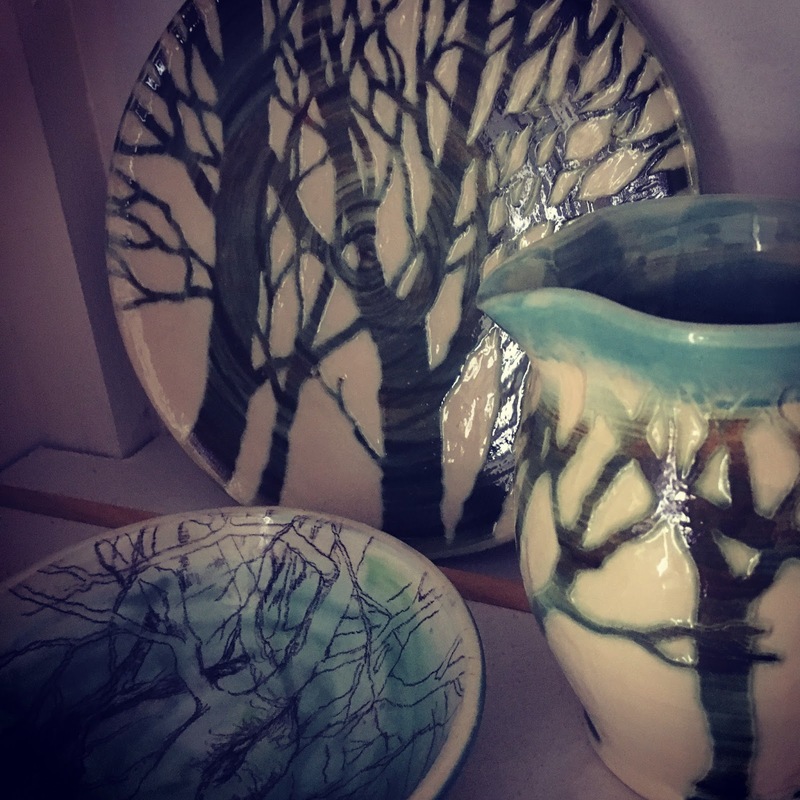 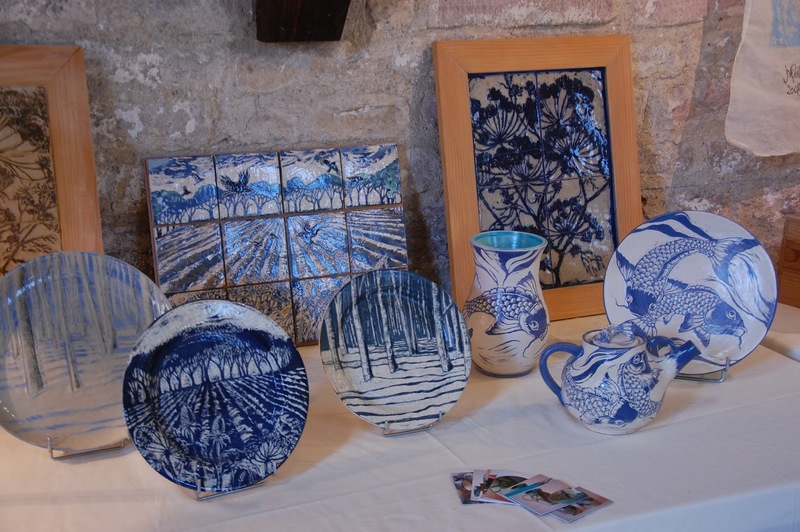 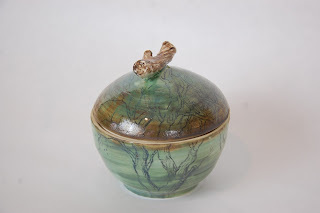 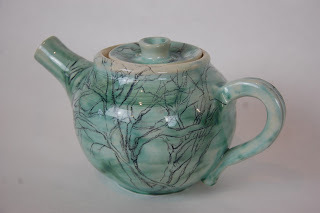 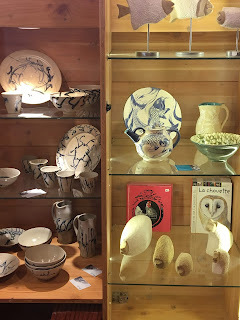 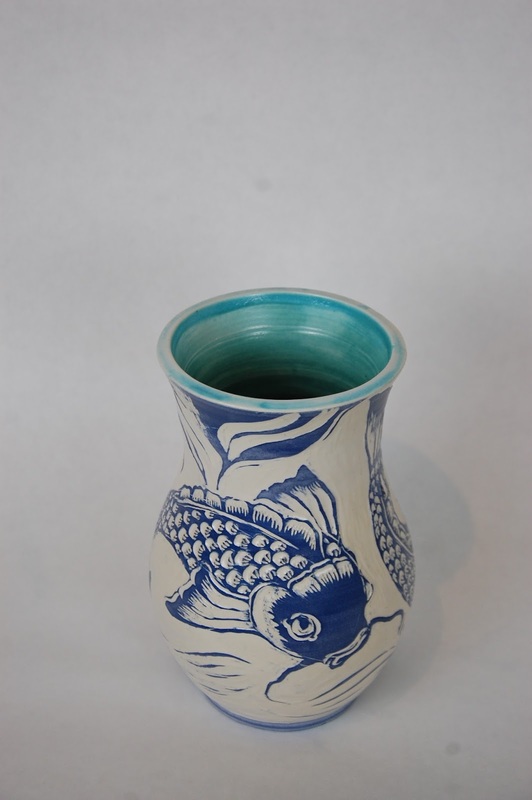 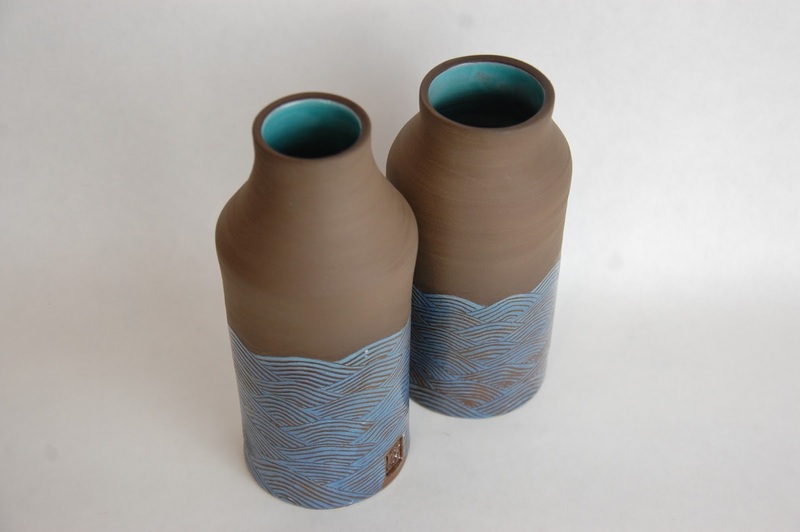 Some of the plates, jugs and bowls in the 'Forest' series are produced using the same sgraffito techniques as those described below for the cobalt blue fish, but I also make pieces where free-hand drawings over copper green slip provide the decoration. 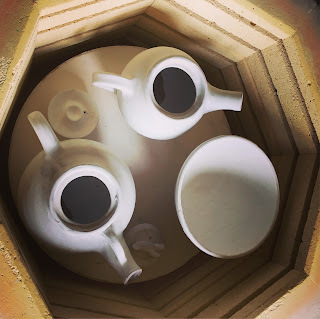 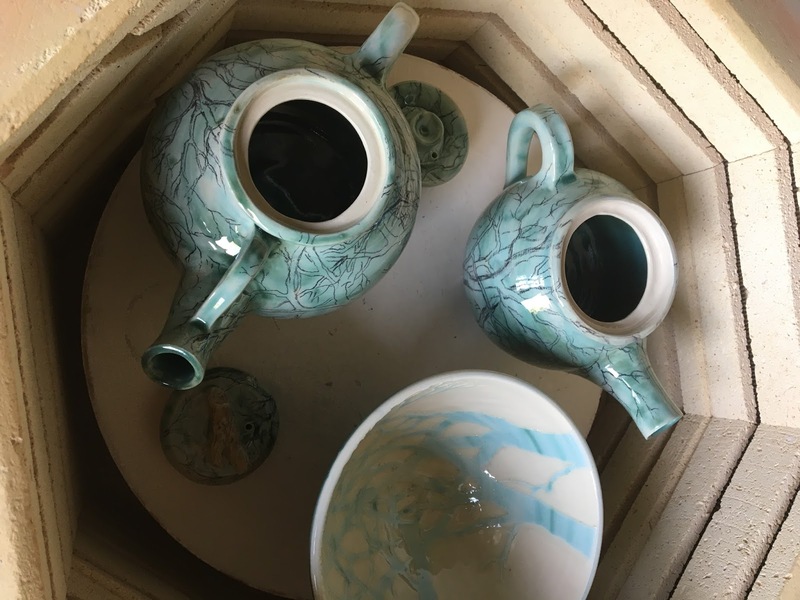 This image shows the pieces stacked in the kiln just before the final glaze firing. Below are some images of me at work on the 'fish' series. 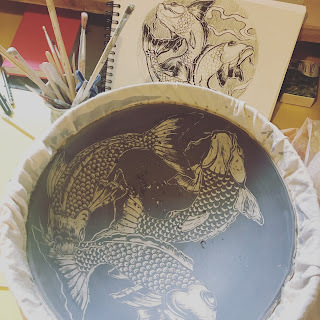 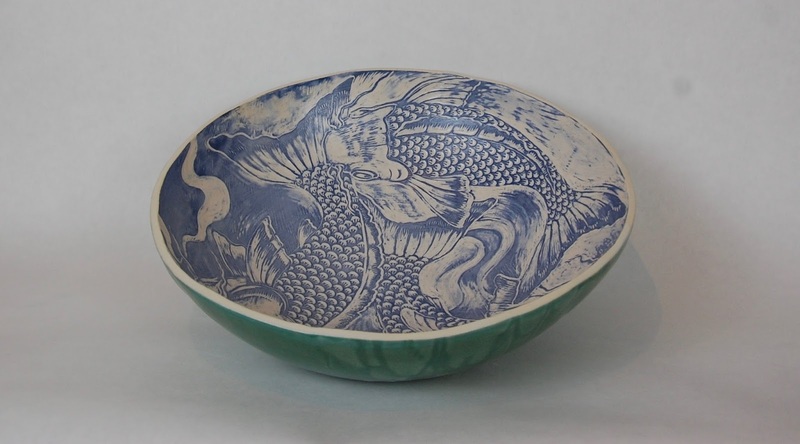 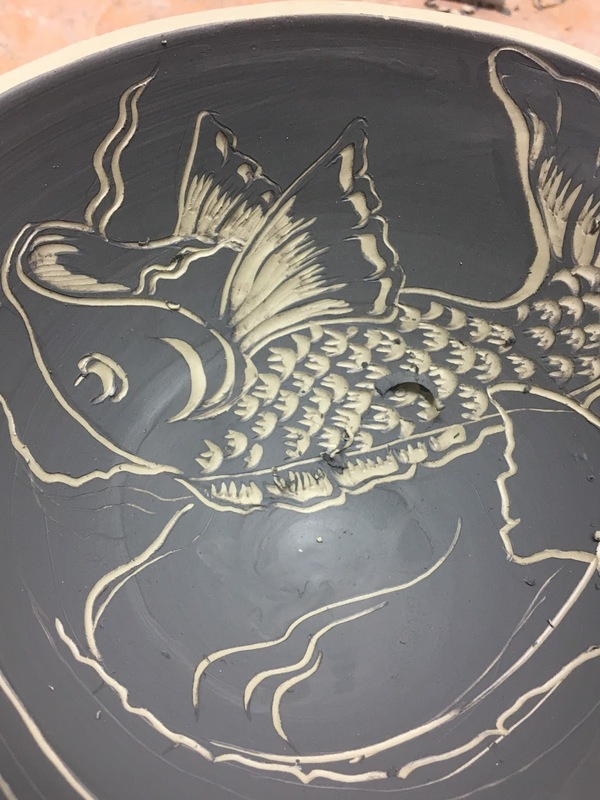 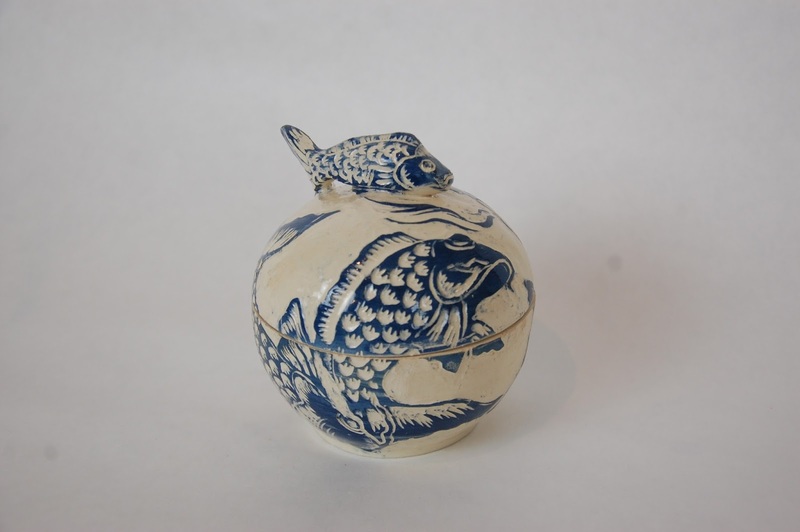 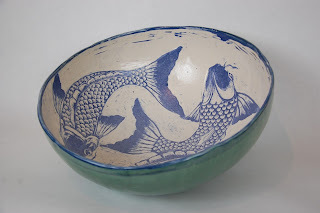 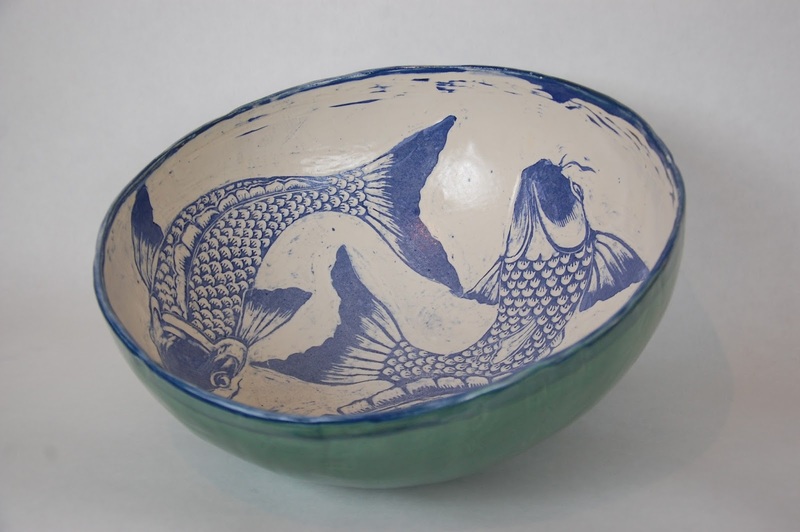 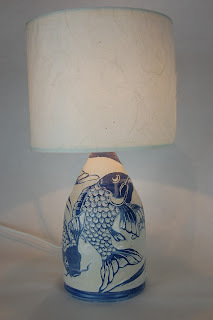 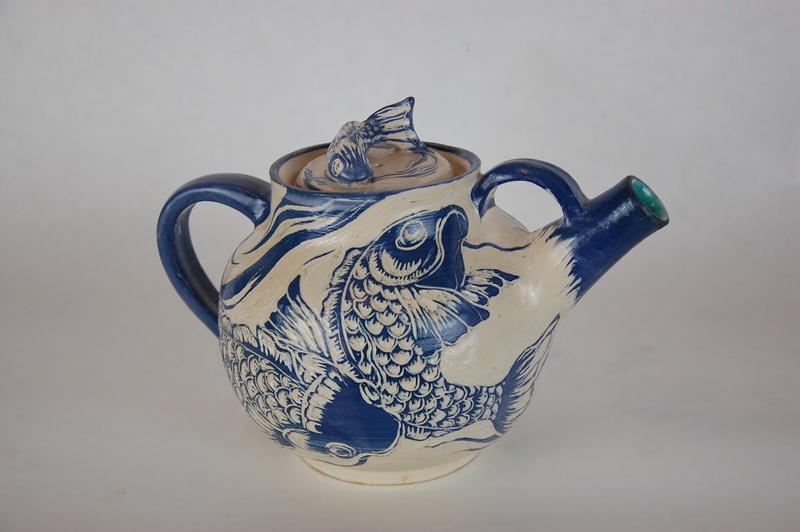 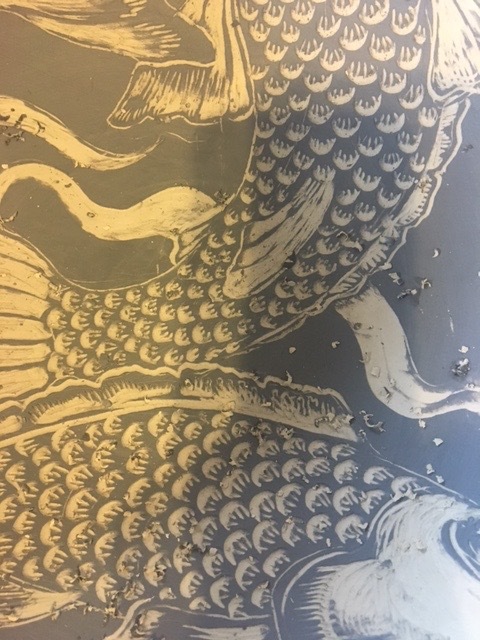 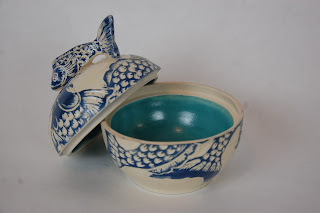 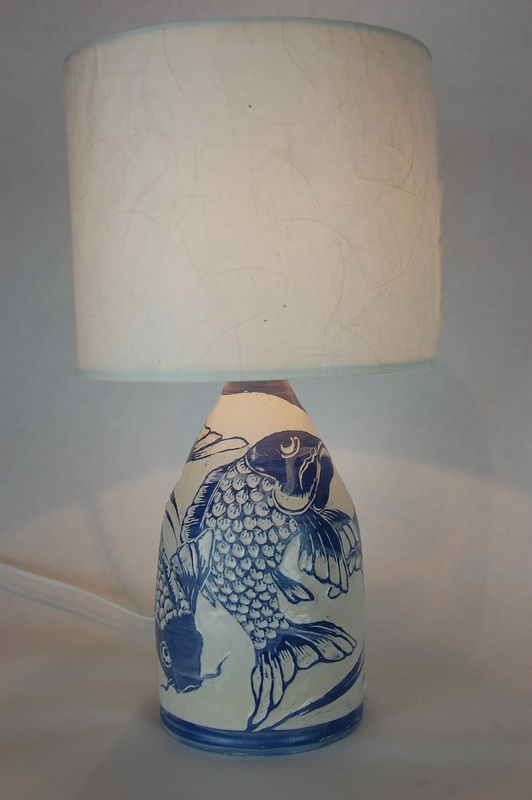 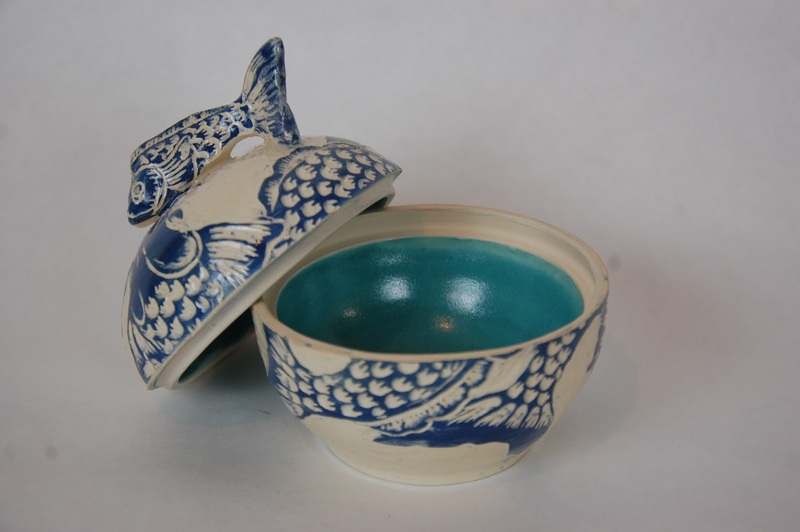 I took inspiration for this design, some years ago now, from looking at Japanese woodcuts and textile prints after somebody had asked me to produce them a bowl with fish on it. 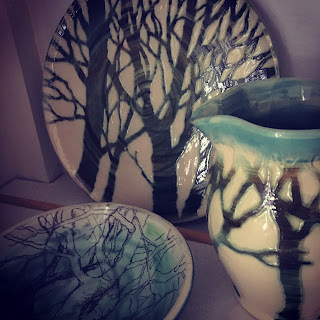 The bowls, tea-pots, plates and vases I went on to produce have proved quite popular so I continue to make them (the carving process never loses its marvellous, meditative pleasure for me!) 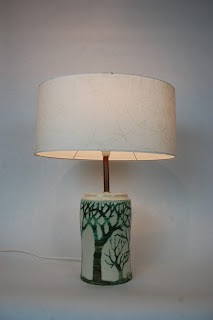 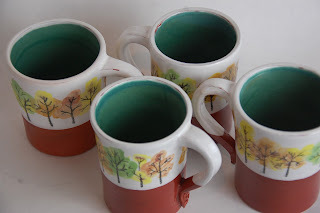 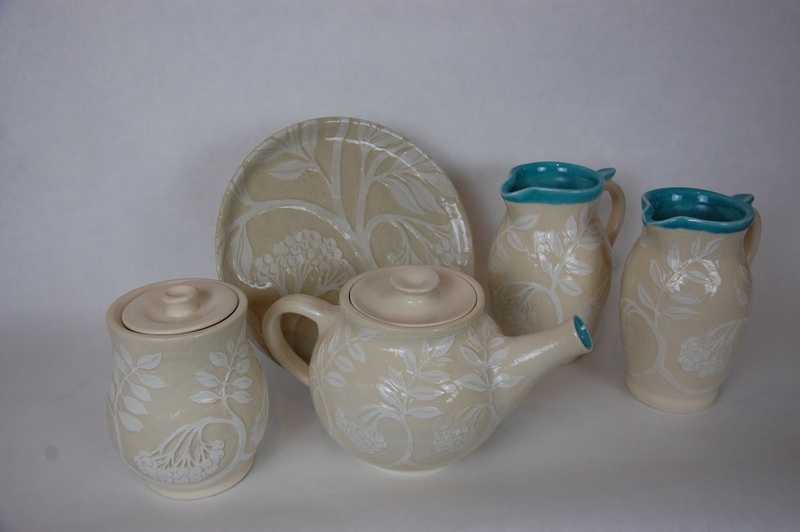 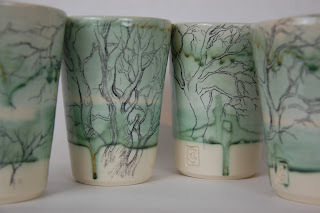 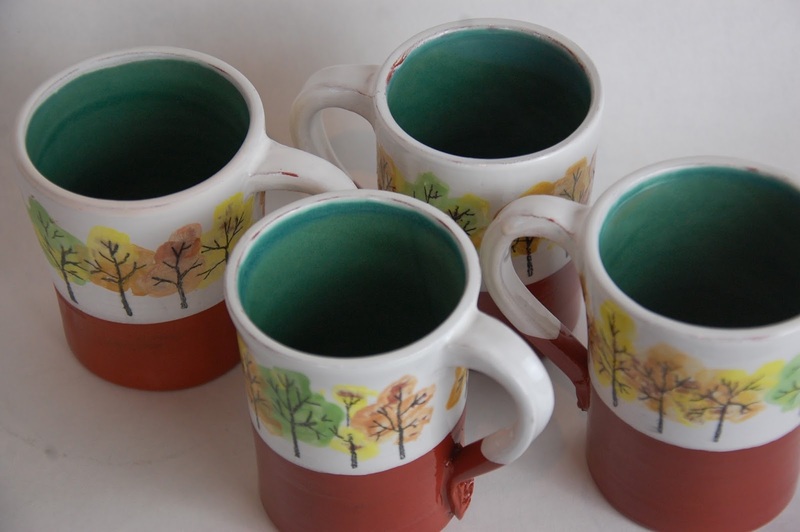 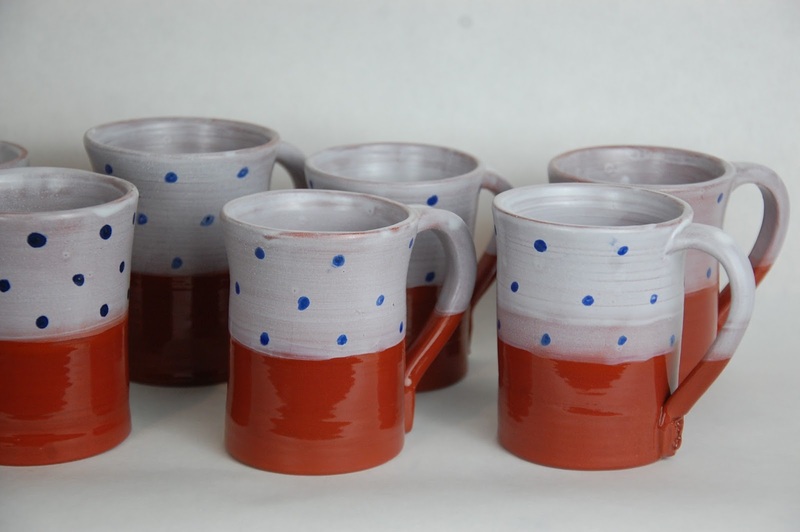 and am now selling them via JonquilCeramics on the Etsy website. 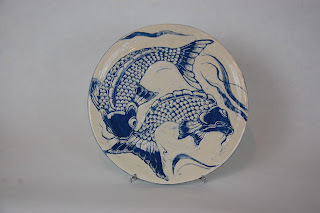 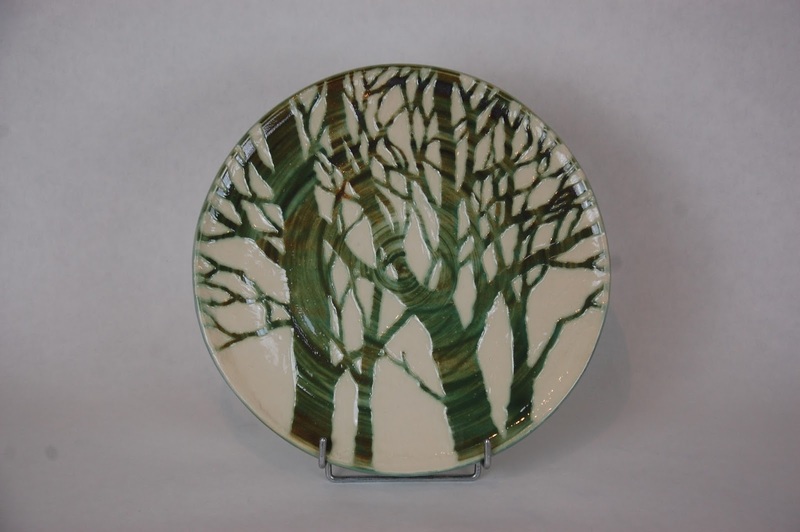 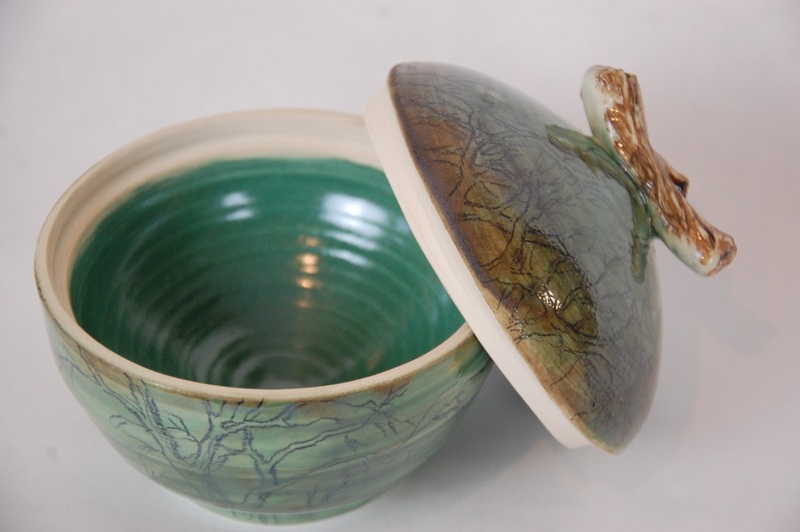 I use white earthenware clay to throw forms on the wheel. 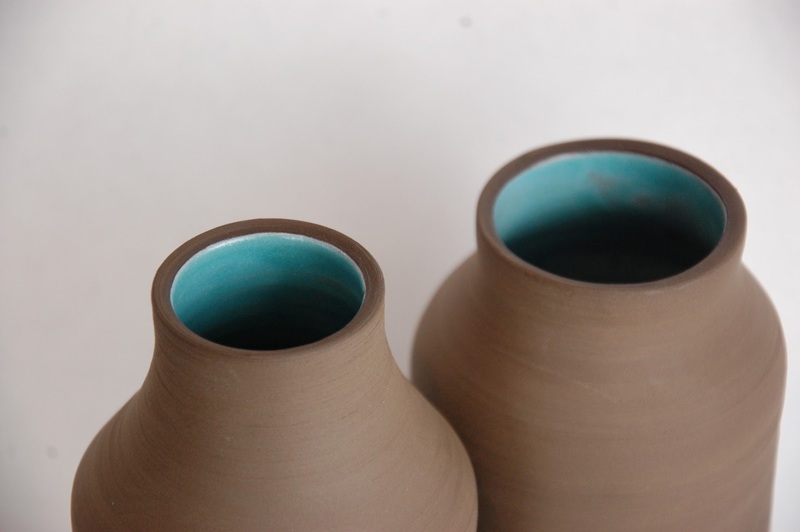 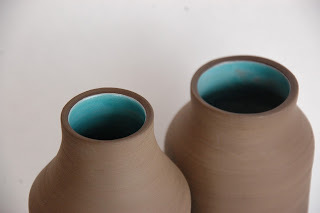 These are then painted with oxide slips (I use cobalt for blue). 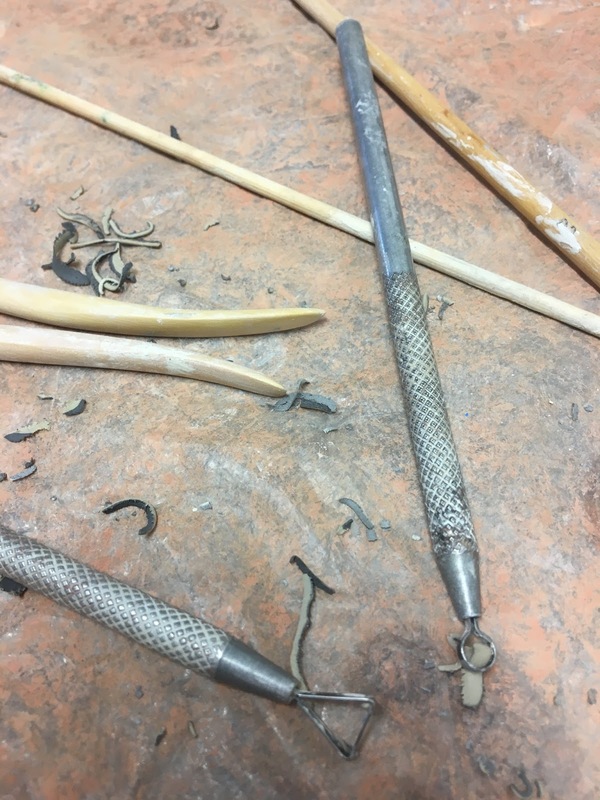 When the slip reaches the right level of dryness (leather-hard) I begin to scrape it away using a range of metal or wooden tools depending on the marks I want to make. 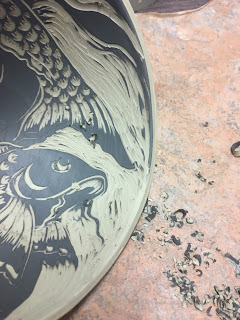 This technique is called 'sgraffito'. When the decoration is completed I leave the pots to dry before a first 'biscuit' firing - to 1000 degrees centigrade, oxidation, in an electric kiln . This usually takes around 9 hours. Finally, I glaze the pieces with a transparent enamel finish which gives a glass-like sheen to the pieces after they have been fired for a second time. 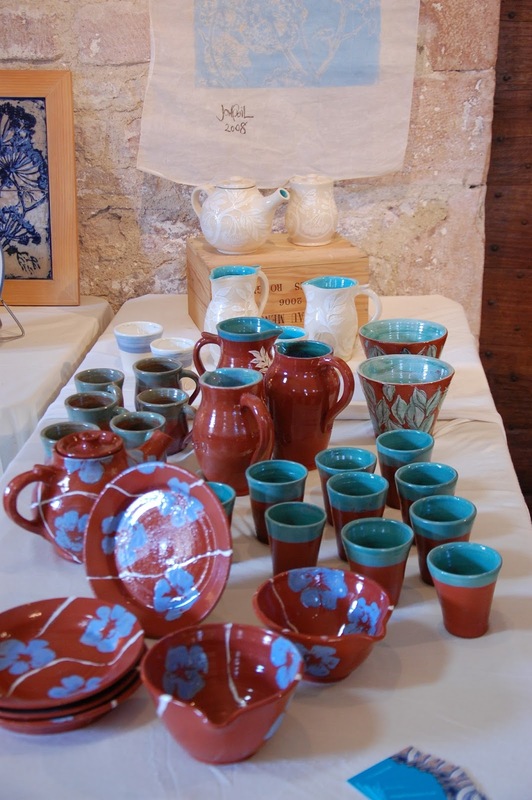 ...in the stunning space of the 12th century Refectories des Moines, Abbey of St Philibert, Tournus, France. 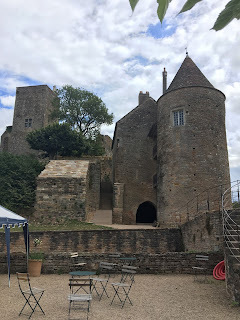 ...site of the extraordinary castle and medieval village that from the 11th century was the seat of power for the Lords of Brancion, and later for the Dukes of Burgundy. 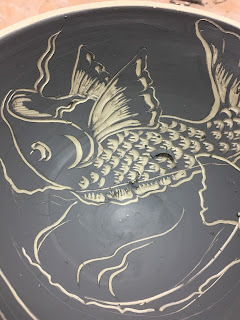 I will post photos of finished pieces once they are fired. 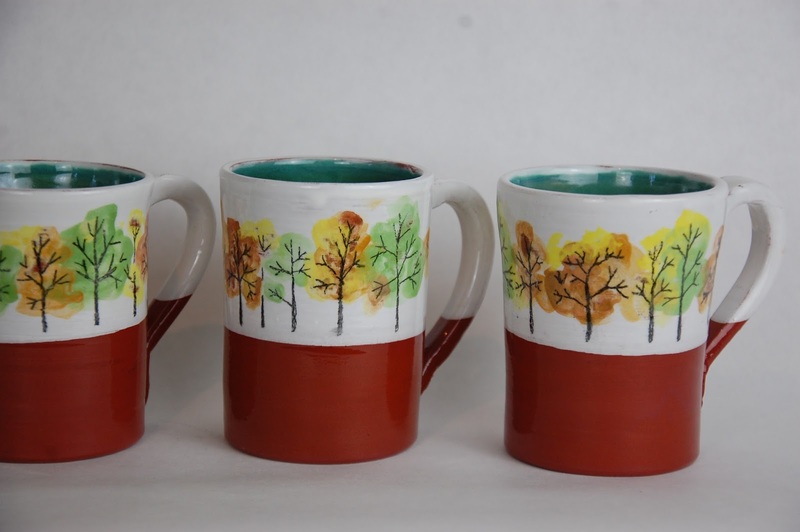 Please contact me directly if you are interested in buying a piece.